Hand Crafted and Carved Indian Bajot Table (Big) dimensions in cm : H 16 W 38 D 38 Wt. 2.54 Kg. Packed unit for delivery dimensions are 48 * 40 * 19 cm and weight 3.0 Kg. 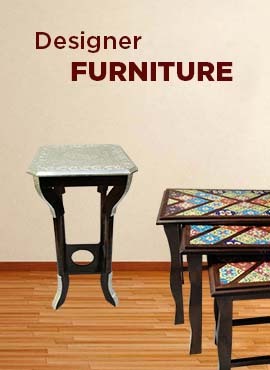 Hand Painted Indian Bajot Table(Big) -The hand painted Indian Bajot is well crafted by skilled artisians and can enhance the look of any setting. It is a perfect home decor that will add detail to your room. Its height of 16 cm and width 38 cm and depth 38 cm with base weight 2.54 Kg is a convenient piece to move around in home. Packed unit for delivery dimensions are 48 * 40 * 19 cm and weight 3.0 Kg.